Scotland 16/1 or England 6/1 at 888sport! Choose your price boost! 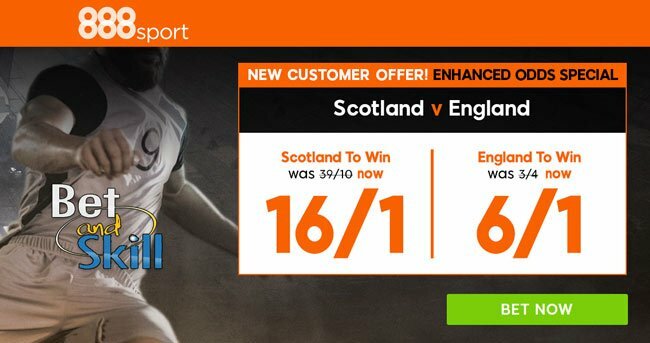 Scotland and England renew their famous rivalry when they lock horns in World Cup qualifier on Saturday evening, and leading bookmaker 888sport are offering new customers the chance to back 16/1 Scotland or 6/1 England to win! Make your choice! What are you waiting for? Scotland know that a defeat to England will be a massive blow to their chances of qualifying for next summer’s World Cup while England are yet to taste defeat in World Cup qualifying and they have already beaten Scotland 3-0 during this campaign. Who will win this time? 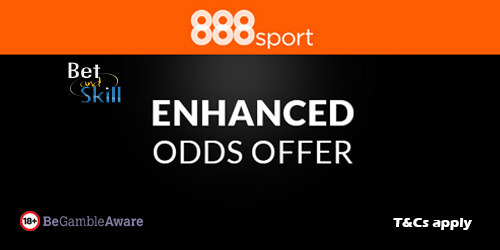 Get enhanced odds on Scotland v England when you join 888sport via this page! Promotion is valid until June 10th 2017 16:59:59 GMT. Any bets placed after the start of the Scotland V England match will be paid out at normal odds. A qualifying bet is a ‘real money’ stake of at least £5 placed on either Scotland or England to win. (‘Match’ winner market only). Only the first bet placed following registration on either Scotland or England will qualify for this promotion. Single bets only. Permutations, free bet and live bets do not count – for the avoidance of doubt a live bet is placed after the advertised kick off time. Free bet tokens will be applied to qualifying accounts on the June 11th 2017 (please allow 72 hours in extenuating circumstances). "Scotland 16/1 or England 6/1 at 888sport! Choose your price boost!"